The rollback of regulations protecting "monopolistic industries" from competition has been one of the main legislative stories of the past 20 years. The trucking, railroad, airline, bus, banking, natural gas, and telecommunications industries have all been--to one degree or another--introduced to the world of economic competition. Within the general deregulating movement in the early 90s and the widely spread faith in markets as the optimal socio-economic organizational pattern, it hence appeared natural to start thinking about commoditizing electricity, just as any other major standardized good. The rationale at that time was that any electricity consumer should be able to choose among a large set of energy providers, and competition between them would naturally increase the affordability and dependability of the service. In the past, one utility provided the all components of your energy service: generation, transmission, distribution and retail. Legislatures and the public utility commissions (PUC) of many states have created competition for electricity and natural gas supply. This allows consumers to choose their energy supplier, while the delivery of the energy is still regulated and is the responsibility of the local utility company. In different deregulation processes the institutions and market designs were often very different but many of the underlying concepts were the same. Establish a wholesale electricity market and a retail electricity market. The role of the wholesale market is to allow trading between generators, retailers and other financial intermediaries both for short-term delivery of electricity (see spot price) and for future delivery periods (see forward price). Aggregator - A company joining two or more customers, other than municipalities and political subdivision corporations, into a single purchasing unit to negotiate the purchase of electricity from retail electric providers. Aggregators may not sell or take title to electricity. Retail electric providers are not aggregators. Bundled Transaction/Unbundled Electricity Service - In a bundled transaction, retail consumers pay one price that includes transmission, distribution, and generation. 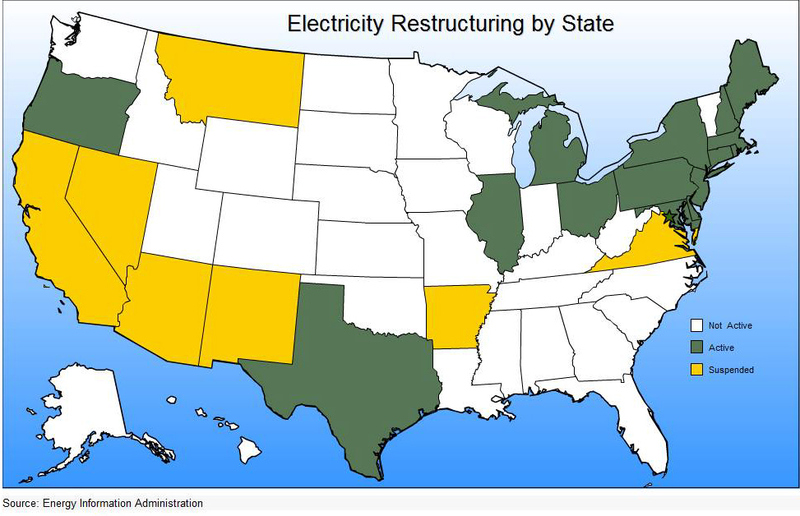 In unbundled electricity service, states have restructured, and consumers are billed for separate transmission, distribution, and generation charges. On March 4, 2002, the U.S. Supreme Court ruled in favor of FERC and held that FERC has jurisdiction over transmission, including unbundled retail transactions. REMC -Rural Electric Membership Cooperative/Corporation - A term commonly used in the name of an electric co-op such as the South Central Indiana REMC. Energy Switch Services - A kind of company that has come to exist since the EU began deregulating the gas and electricity markets, to open them to international competition, in 1996. Pricing structures and special offers are often complicated enough that it's not obvious which supplier and tariff will be best value for a consumer. This has provided an opportunity for specialist price comparison services. These are chiefly offered by companies who will manage a change to a different supplier and tariff, as well as advising on the best one. These companies primarily operate over the Web, although some also offer an ancillary telephone service. Green Pricing Program - Utilities offer their customers a choice of purchasing ;electricity generated from renewable energy sources at a price premium. Often sourced through Renewable Energy Certificates (REC) purchases. A REC represents the environmental, social, and other positive attributes of power generated by renewable resources. These attributes may be sold separately from the underlying commodity electricity. This table from the Department of Energy summarizes utility green pricing programs by state. ISO - Independent System Operator (Also known as RTO-Regional Transmission Organization when service area spans states) - The formation of Independent System Operators and Regional Transmission Organizations ISOs/RTOs) began in the mid-1990s to support the introduction of competition in wholesale power markets. At present, two-thirds of the population of the United States and more than onehalf of the Canadian population are served by transmission systems and organized wholesale electricity markets run by ISOs or RTOs. These ISOs/RTOs ensure that the wholesale power markets in their regions operate efficiently, treat all market participants fairly, provide all transmission customers with open access to use of the regional electric transmission system, and support the reliability of the bulk power system. Currently, 10 ISOs/RTOs operate in the United States and Canada. The cost of setting up and operating an ISO is substantial (on the scale of an American state, several millions of dollars for setting up and between $100M and $200M every year to operate the ISO). PPA - Power Purchase Agreements - Contracts between two parties, one who generates electricity for the purpose of sale (the seller) and one who is looking to purchase electricity (the buyer). There are various forms of Power Purchase Agreements; these are differentiated by the source of energy harnessed (solar, wind, etc.). Financing for the project is delineated in the contract, which also specifies relevant dates of the project coming into effect, when the project will begin commercial operation, and a termination date for which the contract may be renewed or abandoned. All sales of electricity are metered to provide both seller and buyer with the most accurate information about the amount of electricity generated and bought. REC - Renewable Energy Certificate you purchase a Green Plan, Kinetic will purchase renewable energy certificates (sometimes referred to as "RECs") sold by eco-friendly electricity generation sources like wind power facilities, solar plants and bio-generation sites to match 100% of your energy usage. SMD - Standard Market Design - On July 31, 2002, the US Federal Energy Regulatory Commission (FERC) issued a Notice of Proposed Rulemaking on standard market design (SMD) that would help states to set up efficient markets. Sunset Advisory Commission - Created in 1977, by the Texas Legislature to identify and eliminate waste, duplication, and inefficiency in government agencies. The 12-member Commission is a legislative body that reviews the policies and programs of more than 150 government agencies every 12 years. The gradual resurgence of electric power retailing is going to alter the course of the smart grid. More and more, utilities will have to think of the smart grid as a platform. Not just a platform for delivering electrons, but also a platform for delivering "apps for electricity" – innovative bundles that combine electricity with other things. Reasonable reliability at reasonable prices will not be enough. Consumers will gradually begin to clamor for a better value proposition. And to pressure utilities to give them access to the choices and options that will be available already in places such as Texas and the UK. In a deregulated marketplace, the price of electricity fluctuates by the season, the weather, and by the time of day. Prices are governed by the amount of available generating capacity and the amount of demand. But consumers are charged just a flat fee for their use of electricity that does not vary with the cost of electricity that they are using. The technology for charging consumers varying prices based upon the time that they use electricity has not yet been developed and is several years away. Thus consumers are not encouraged to use electricity in an economically prudent way. Many economists believe that until there is a way for the demand for electricity to respond to changes in price, retail electricity deregulation will not be successful. Someday demand will be so elastic that competition could work efficiently, and engineers will no longer need to worry about reliability. Enormous amounts of intellectual energy have been poured into designing markets that can work in real time when the demand side of the market is not priced in real time. 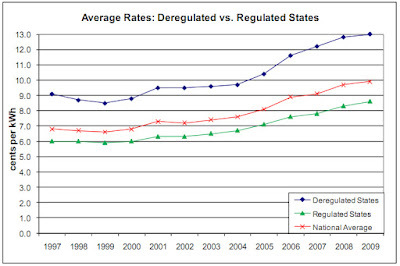 Higher Consumer Prices - The states that deregulated retail prices had higher prices before deregulation began, perhaps that was their motivation. However, the gap hasn't narrowed. 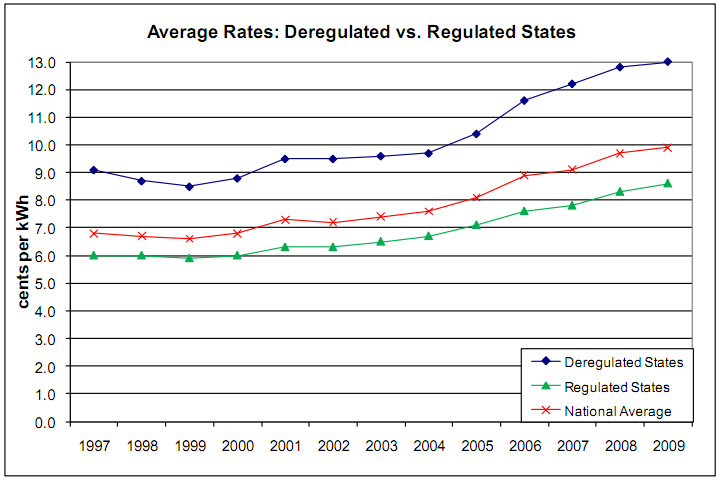 In 1997, the states in the deregulated category had average rates that were 3.1 cents per kWh above rates in the regulated states (9.1 vs. 6.0). Unfortunately, the retail choice experience – complete with the combined effect of divestiture of utility generating assets, and exposure of retail consumers to wholesale rates set in RTO markets – has resulted in an even larger gap in 2009, with deregulated states paying, on average, rates that are 4.4 cents per kWh above rates in regulated states (13.0 vs. 8.6). Price Volitility - Because of the non-storability of electricity, supply and demand are very inelastic and prices are very volatile. Market Manipulation - After a 2007 independent auditing study, the Texas state PUC found TXU has abused the market by manipulating supply at peak periods during the Summer of 2005, raising energy costs $57 million adding $18 million in profits during that short term. The Dallas-based TXU Corp.’s market manipulation case was settled for $15 million and without an admission of wrongdoing by the company. Market Cooperation - Because electricity is hard to store, a great deal of coordination is necessary to meet customer demand. It takes time and money to stop and start units, so there has to be a degree of signaling between companies on when they need to move power, or make it. Market Oversight - Of 30 Texas cases dealing with power market abuse in 2009, 29 were settled without the company admitting wrongdoing, the report noted. Without forcing restitution of some type, consumers have no recourse to recover damages from higher prices, the Sunset Commission said.The Sunset Commission found the Texas PUC Lacks Regulatory ToolsNeeded to Provide Effective Oversight and Prevent Harm to the Public. as an effective deterrent and to immediately halt actions that are of eminent danger to the public. PUC’s limited oversight of certain telecommunications entities also suffers because the agency’s list of some regulated entities is inaccurate. This inaccuracy occurs primarily because no renewal process exists to ensure timely tracking and updates of the active status of these organizations. Increase PUC’s administrative penalty authority from $25,000 to $100,000 per violation per day for electric industry participants’ violations of Electric Reliability Council of Texas’ (ERCOT’s) reliability protocols or PUC’s wholesale reliability rules. Externalities not included in Retail Price - In case of congestion, the power plants used to meet excess demand are often coal fired and have detrimental effects on the environment. The environmental cost is indeed not factored in electricity market prices which encourages producers to use cheap and dirty energy sources. Reliability - One of the main ways that deregulated electricity markets could lower prices in the long term is the unavoidable reduction of monopolistic overcapacity by the market. This reduction in reserves and the higher risk of disruption associated with it is potentially so harmful that even fierce electricity liberals admit that it’s impossible to give the same breathing space to sellers as in another market. Effective cooperation between federal and state regulators to fix a variety of market imperfections and resulting market performance problems. Texas - In January of 2002, the Texas state legislature passed Senate Bill 7, opening up most of the state’s residential market to competition (the exceptions being large municipalities like Austin and San Antonio, and areas served by rural cooperatives, of which Texas has a large number). In the ensuing nine years, the market has developed in a vigorous manner, with customers able to choose today from more than 50 Retail Electric Providers (REPs) and more than 250 different electric plans, varying by term length (from month-to-month to as long as five-years), fuel type (varying mixes of fossil and renewable), and customer service type (traditional vs. on-line). There exists as well a lively debate as to whether competition has achieved its goals as set forth in the original legislation, i.e. a) greater breadth of available consumer products (little doubt on this score) and, b) reduced electricity prices (considerable debate on this one). United Kingdom - The United Kingdom opened the electricity market by stages, from 30% in 1990 to 100% by 1998. The 1989 Electricity Act created a system of independent regulation, headed by the Director General of Electricity Supply (DGES) covering England, Scotland and Wales. The regulator’s principal roles are to ensure that competition develops smoothly and effectively and where competition is inappropriate, to protect customers. In 1999, the regulatory offices for electricity and gas (OFFER and OFGAS) were merged to form the Office of Gas and Electricity Markets (OFGEM). Northern Ireland has its own regulatory body, the Office for the regulation of Electricity and Gas (OFREG). The process of electricity deregulation has followed different paths in England and Wales, Scotland and Northern Ireland. The electrical industry in England and Wales has four principal components; generation, transmission, distribution and supply. Generation and supply are open to competition and price is not regulated. Transmission and distribution, which are natural monopolies, are subject to price regulation. The National Grid Company, the transmission network operator in England and Wales, has a central role in the industry. It has a statutory duty to develop and to maintain an efficient, coordinated and economic transmission system and to facilitate competition in supply and generation. Distribution remains a monopoly business and under the Utilities Act 2000 it has become a separately licensable activity. Nine distribution companies operate 12 authorised distribution areas. Genability - San Francisco Startup - there are about 3,000 utilities in the U.S. with tens of thousands of electric rates devised for various classes of residential and commercial customers. And those rates fluctuate – about 3,500 rate updates occur every month, By assembling the electric rates, developing data-crunching tools, and offering the data to customers via a website, Genability is taking on a task that many solar service providers would rather avoid. Tradition Energy - One of the world’s largest energy procurement advisors to commercial, industrial and governmental organizations. Represented in 27 countries, Tradition employs over 2,500 people globally. Tradition is the interdealer broking arm of Compagnie Financière Tradition (CFT) and is listed on the Swiss stock exchange. Notable REP's in Texas include include: Glacial Energy, Kinetic Energy, Reliant Energy, Dynowatt, Texas Power, Ambit Energy , Bounce Energy, MXenergy, Direct Energy, Stream Energy, First Texas Energy Corporation, Gexa Energy, Cirro Energy, StarTex Power and TechStream Energy. EcoPinion: Resurgence for Retail Electricity Choice and Competition? - EcoAlign, March 2011 After conducting 1,000 online surveys in March 2011, the EcoAlign consultancy found "overwhelming support for the concept of competition in the retail purchase of electricity." Thanks for explaining in a nutcase. The infographic says it all while I picked up facts from reading the information. My only problem is that the electric distributors charge too much.